The main difference between heart and mind is that the heart, figuratively, is believed to be related with the emotional sentiments while the mind is believed to be related mostly with rational thinking. Heart and mind are often talked subject matters among us. Though human biology distinguishes heart and mind as two organs or entities with concern to the thoughts and emotions in us; it is difficult to differentiate our conscience as mind and heart since these differences are entirely based on our perception. According to biology, the human heart is the organ situated in between our lungs, which performs the primary function of circulation and the purification of the blood. It consists of four chambers that assist in performing this function most efficiently. In figurative terms, heart is related to most emotions and sentiments. With contrast to our logical thinking, the emotions are believed to be generated from the heart; they are more biased towards humane sentiments like love, affection, kindness etc. Consequently, in situations where one is in love with another, we tend to say it is the heart that governs us but not the mind. Similarly, during situations where we have to make rational arguments, we tend to say that is it our mind that precedes our heart. 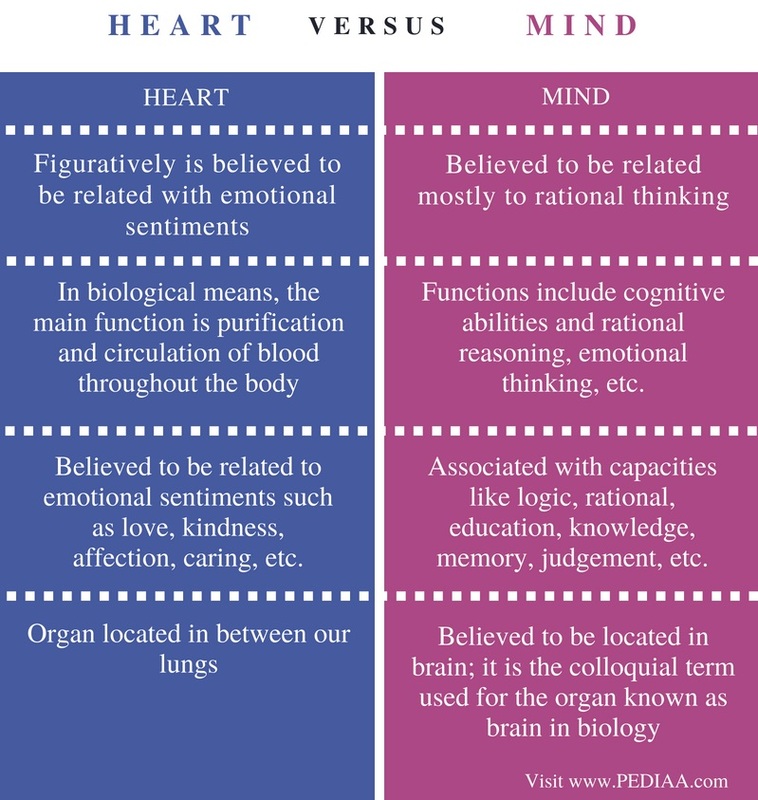 Therefore, it is evident that this biological organ cannot generate thoughts, but according to human perception, emotional sentiments are originated from our heart while rational thinking is not. However, one should always consider that heart cannot generate thoughts and emotions; what is responsible for that should be consciousness or awareness, such as one’s mind. In brief, mind is a set of cognitive faculties including consciousness, perception, thinking, judgement, language and memory. It is usually defined as the faculty of an entity’s thoughts and consciousness. Therefore, it holds the power of imagination, recognition, and appreciation. It is also responsible for processing our feelings and emotions, which results in attitudes and actions. Nevertheless, in colloquial usage, we refer to our brain as our mind. Similar to heart, in a biological sense, brain is the central control unit of our body. It is the main organ responsible for the proper management of all our bodily systems and generating the most suitable responses to our physical as well as emotional reactions with its millions of neurons functioning collectively. However, some consider that mind and brain are two entities, but they function in close relation to each other. Moreover, one could express mind as some awareness, which is more or less not physical. For example, think of situations where people experience near death experiences or being in a state of coma, here this physical organ known as brain disables functioning but it then our mind: a collection of our thoughts, emotions etc. that functions and define who we are. Then we can not exactly trace the location of our mind, as either within the brain or in the heart. 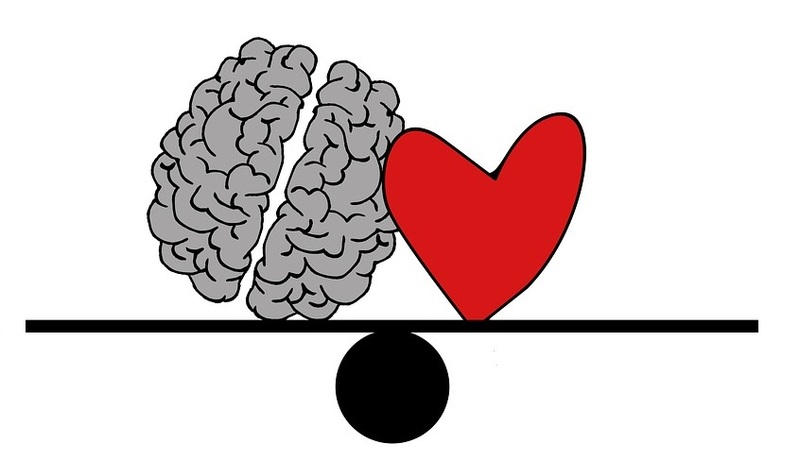 The heart, figuratively, is believed to be related with emotional sentiments while the mind is believed to be related mostly to rational thinking. In biological means, the main function of the heart is purification and circulation of blood throughout the body while the functions of mind include cognitive abilities and rational reasoning, emotional thinking, etc. The heart is believed to be related to emotional sentiments such as love, kindness, affection, caring, etc. while the mind is associated with capacities like logic, rational, education, knowledge, memory, judgement, etc. The heart is the organ located in between our lungs while the mind is believed to be located in our brain; mind is the colloquial term used for the organ known as brain in biology. However, it is difficult to trace the exact location of our mind in our body. Heart and mind are a much-conversed topic in our daily communications. Therefore, many try to find their exact differences pertaining to their biological as well as non-biological significance. One such significant difference between heart and mind is that heart is figuratively believed to be related with the emotional sentiments while mind is believed to be related mostly with rational thinking. In brief, mind is the non-physical entity responsible for all our cognitive, logical as well as emotional responses and thoughts. 1. “Mind.” Wikipedia, Wikimedia Foundation, 5 July 2018, Available here. 2. “Heart.” Wikipedia, Wikimedia Foundation, 3 July 2018, Available here.